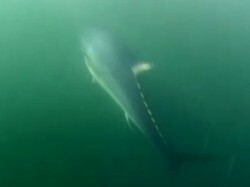 There are countless trolling lures available to anglers. 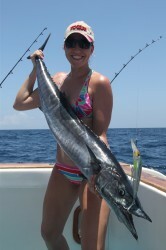 However, very few can stand up to the brutal assaults inflicted by Wahoo. 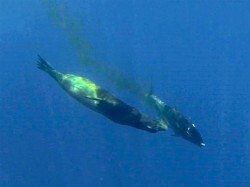 In addition, any lures used for Wahoo need to be able to perform well at very high trolling speeds. For these reasons Wahoo fishing is the ultimate test for new trolling lures. The folks at Yo-Zuri already dominate the high speed trolling lure market with the incredibly popular Bonita, and now they have added the Sashimi 3D Magnum. This lure performs well at nearly any speed and never requires any adjustment. We tested the 7 inch / 3 ounce sinking version. 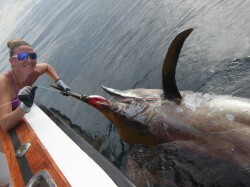 They also make a deep-diver version specifically designed to target Grouper and for other deep trolling applications. The sinking version of the Sashimi 3D Magnum is available in 7 colors and both a 7 inch and 5 1/2 inch sizes. 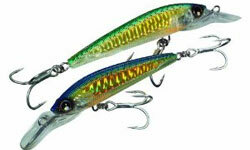 Thse lures have an incredible finish and feature through-wire construction and 3x strong treble hooks. We used these lures every day for over 2 weeks in the Galapagos and caught dozens of Wahoo up to 100lbs and countless Yellowfin Tuna up to 80lbs. These lures were a huge improvement over the traditional metal lipped lures we had been using. They required absolutely no tuning and every color we used caught fish. We trolled them with and without wire leaders and they performed equally well. These lures eventually became our go-to trolling lure when we were exploring new areas for big Wahoo and Yellowfin Tuna. 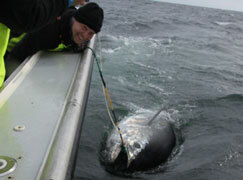 However, as with ANY lure we use in extreme conditions we replaced the hooks with the heaviest available trebles.